What should have we expected from the tie against the strongest team in the history of the Champions’ League aside from an honourable exit? Our fixture against Bayern was the last part of The Helleven Days-period after we had three tough matches against Liverpool (twice) and Manchester United. Bayern didn’t have any such problems in the Bundesliga where opponents usually roll over and pray for conceding less than five. One of their opponents this season rested their two best players for clashes they can actually win which says a lot about how Bayern are team from a different planet for the rest of Germany including the injury-depleted Borussia Dortmund. Our boys went out on the pitch and gave a brave performance. Here are key pointers from the last night. 1.Bayern are too strong for us. It was something that we have known for a while. Guardiola’s Bayern are even better than Heynckes’ and we shouldn’t expect complacency in the second leg. It’s not like Bayern can’t lose or spill a two-goal-cushion – after all, Manchester City – without Kompany, Yaya Toure and Aguero – managed to over-turn a two-goal-deficit at Allianz Arena. However, I believe that match was just a blip and that the Bavarians won’t let us come anywhere near in the second leg. Last season, we won on their home turf against a side that played without Ribery and Schweinsteiger. Bayern played without two of them last night as well but now they have players like Goetze and Thiago to replace them. They have two or three players for every position. After Szczesny had been sent off, we could only hope that the same would happen to Jerome Boateng. The former Manchester City defender made two bookable offences last night and should have been sent off at 0:0 after he had brought Wilshere down. Guardiola neutralized that possibility by replacing the German defender with Rafinha. 2.Perhaps this defeat was a blessing in disguise. If we had an active result – o:o or even 1:0 victory – we would have expected to knock the Bavarians out of the Champions’ League. Our squad would have been stretched on three fronts – this defeat might persuade Wenger to concentrate on more winnable competitions. Three days before the second leg against Bayern we have a tough FA Cup match against Everton. Four days after our trip to Munich, we’ll visit our noisy neighbours in the NLD. 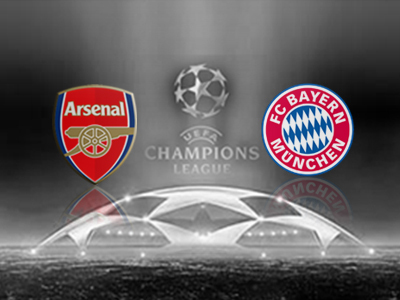 Therefore, it would be wise to rotate as much as we can in Munich and beat our domestic rivals. 3.Kieran Gibbs’ injury might be the biggest blow from last night. The English full-back had done well before he got injured and replaced by Nacho Monreal. Bayern focused their attacks down the right flank where Robben and Lahm constantly combined with the overlapping German being a real menace. After Gibbs had to switch out, Monreal – without any warm-up – was exploited heavily by Robben. 4.Nacho Monreal must step up. Nacho hasn’t played well lately but he will probably get a run in the first team given that Gibbs was injured last night. Of course, it’s not just Nacho – his partner on the left flank (I’d pick Rosicky) has to help him more. The German has missed two penalties out of two taken this season (both in the Champions’ League, both at the Emirates) and it’s hard to say which penalty was worse. The “more of a passer than a finisher” phrase is obvious, Wenger has used it once to describe the German and it’s shown its ugly face on more than one occasion. Still, penalties can be missed and Mesut’s dribbling that had earned the penalty in the first place should save his confidence for the remaining matches this season. We’ll have at least fourteen matches to play until May including away matches against Spuds, Chavs, Bayern and Everton with visits of Everton and Manchester City scheduled for next month too. 6….and should show his class against Sunderland again. When Ozil signed for us, he had the warmest reception among Gooners. His signing was like a glass of cold water to someone who had walked for hours through a desert. His very first match for Arsenal was against Sunderland. His first touch was smooth and it didn’t take long before he picked his first assist for Olivier Giroud’s fourth goal in four appearances in Premiership. Five months later, Ozil’s self-confidence doesn’t look too high and fans have been rather harsh on him lately. He has been a victim of Ramsey and Walcott’s injuries – a bit like another hero of his first assist Olivier Giroud. We play at home against Sunderland and – if Ozil plays – he might restore some of his confidence. 7.Yaya Sanogo had another interesting match. The French youngster looked lively again and only a brilliant goalkeeper like Neuer stood between Sanogo and his first goal for Arsenal. His pace and ability to close down the opponents are intriguing and with proper work with him, Wenger might make him a top-drawer striker, just like he did with Adebayor. 8.Oxlade-Chamberlain is our best player right now. At this point, The Ox is our in-form player. That has been our biggest strength this season – we have shared the burden among our players. At first, it was Giroud. Then it was Ramsey who kept us on top. Walcott had a brief spell of brilliance before he got injured. Wilshere and Cazorla have been the best in January. Oxlade-Chamberlain’s shift has started in February. He would have been on the score-sheet if we hadn’t had to play with ten men for over 50 minutes. Our next match is against Sunderland at home. Some rotation will be needed but we should win the match against The Black Cats without problems.